Back in Mali at the Sleeping Camel in Bamako I met Kevin and Heike, who have been on the road for ages, and they came up with an idea. That idea was to avoid a lot of corruption, hassle and tedious waits in cities we didn’t want to go to, just to get visas for places we would then spend less time driving through than it took to get permission to enter in the first place. Why not ship the cars direct to Namibia? Some people see this as cheating, but we aren’t the sort of people to be interested in doing things just to say we’ve done them and it seemed like a good idea to me. 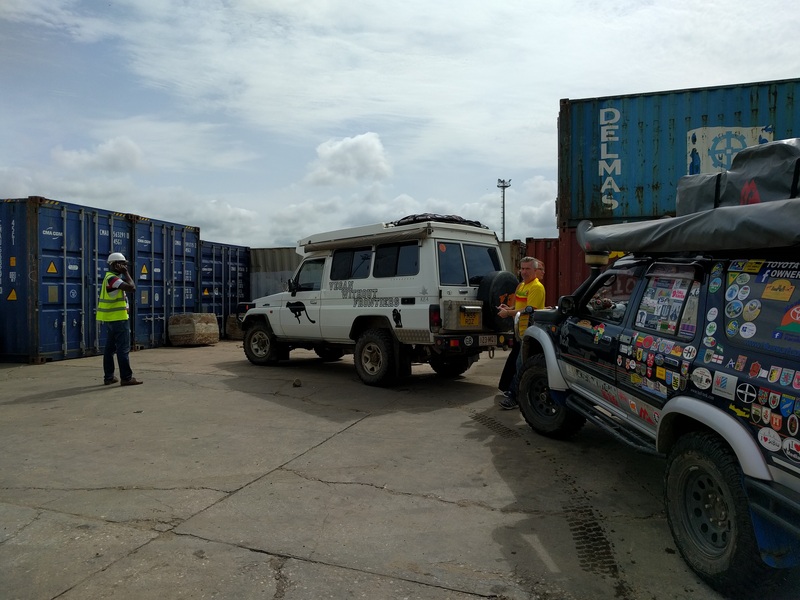 So I set about finding out how this might work and the end result is that Troopy is now in a container with their car, about to be loaded aboard a ship in Lomé, Togo and we are all taking a time out before meeting up again in Namibia in a few weeks time. I’m quite happy about this after my latest experiences with corrupt police and officials, especially given that Nigeria was next on the overland route and it has one of the worst reputations in Africa. 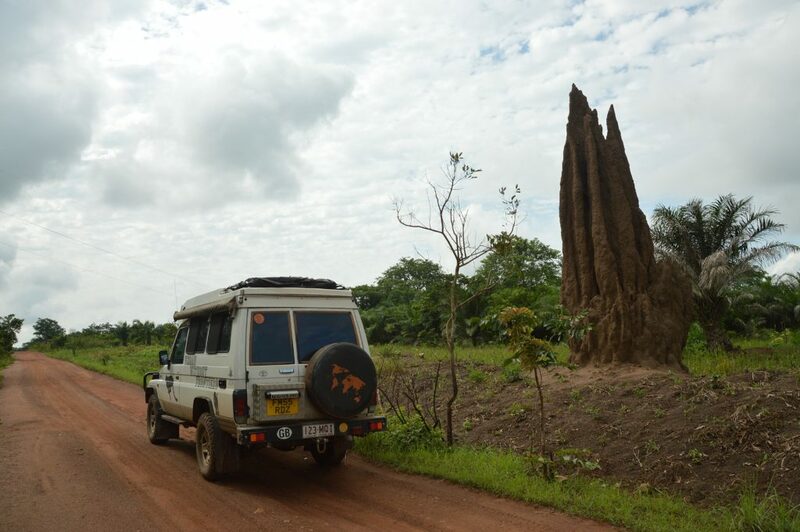 It all started so well at the Togo border with Ghana – a beautiful forested mountain route leading from slightly potholed Ghanaian tarmac across a bridge onto a Togolese sandy track winding through the forest along the contours of a steep valley. 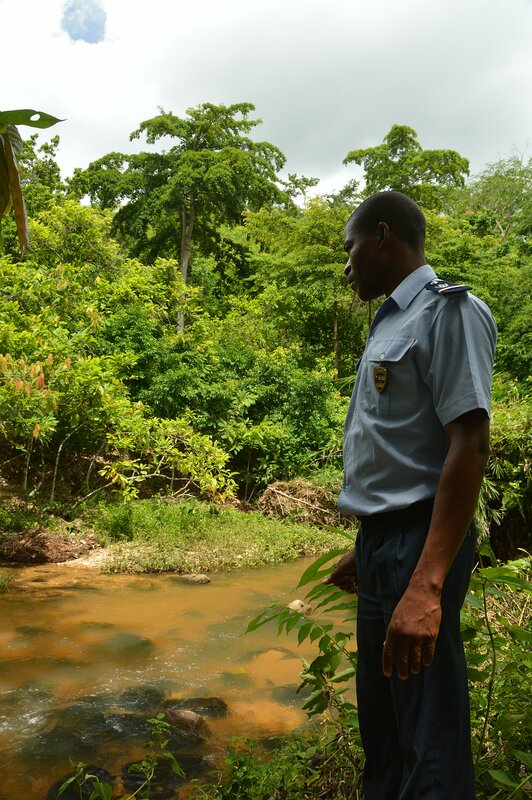 All the border officials on both sides were just really friendly – especially the police officer on the Togo side, who had to break off the border formalities to chase off a snake that appeared hanging in the bushes by the barrier. Having left Roots Yard I was well fed and had an enjoyable day driving through Togo, stopping in occasional villages for a snack of barbecued corn or beignets (spicy bean fritters a little like falafel). I had the vague aim of meeting Kevin and Heike somewhere further North as they made their way down from Burkina Faso, and had picked a place to stay in Atakpamé – the Hotel California. 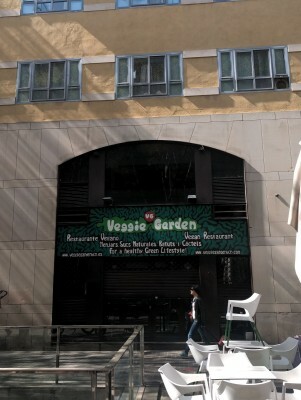 This place, attached to a Total garage, turned out to be a bit strange. The kitchen was no longer in operation, so I found food on the streets, and the next morning it turned out I could leave whenever I liked, though checking out proved a challenge. I don’t think they have many guests, and in order to pay I had to drag ‘le patron’ from his bed and push notes into his hand through his bedroom door. The shipping saga took a turn for the worse about this time, since I’d got a bit accustomed to Ghanaian mobile internet and slack with communicating, and internet of any kind was suddenly non-existent here. In a couple of days of communication blackout, Kevin and Heike concluded they weren’t going to make it to Cotonou on time and that I’d gone off on my own, so slowed down and diverted into Togo. I was not aware of this – and not being able to contact them decided to just head on towards Benin to be ready when they arrived. 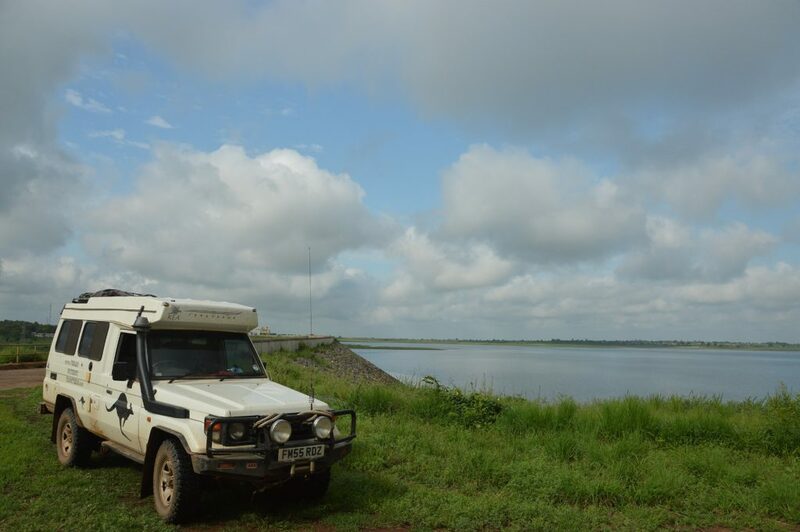 My second day in Togo was therefore going to be my last, and I headed off down dirt roads towards the border via the Nangbeto dam. The police guarding the dam were also really friendly, spoke English, and offered to give me a tour of the Hydro Electric plant at the dam. 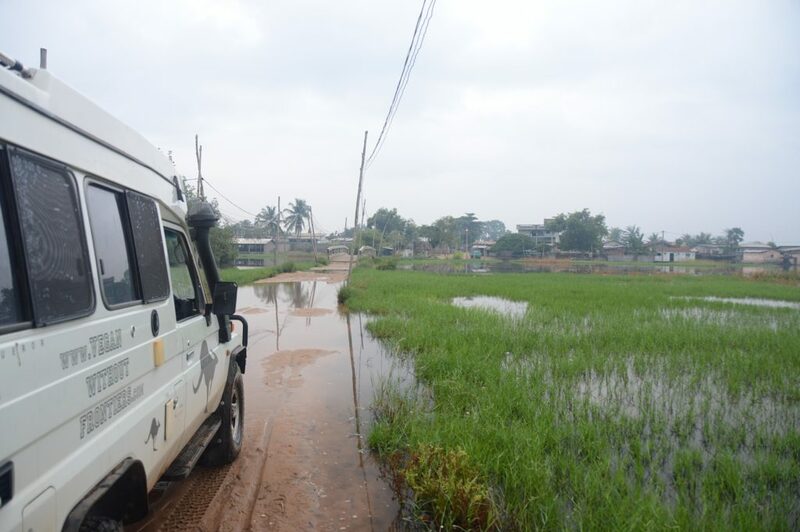 After that, there was a long and slow, but pleasant drive on rolling dirt tracks with big, deep puddles Southwards through fields and villages along the border with Benin. 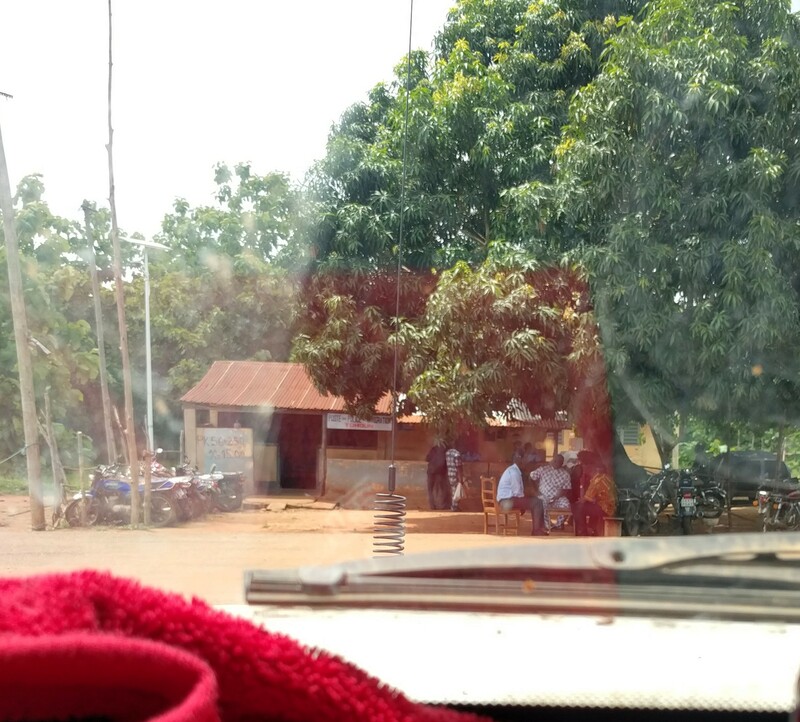 A pleasant day then turned a little ugly at the border, where the Togolese police officer decided he needed 20,000CFA (£25) to allow me to pass. A 2 hour standoff ensued in which we both played the ‘I’ve got all day’ card, but in the end I crossed into Benin without paying anything. The fact that the Benin customs then overcharged me for the Laissez Passer (with a grin) by 2,000CFA didn’t seem to matter. I rolled into the sandy beach resort of Grand Popo feeling the day had been a success and set up camp under the pines and palms of my own field at the Auberge de Grand Popo…where the WiFi was out or order, but might be fixed tomorrow. The morning was clear and still, so a paramotor flight was definitely in order and I figured it was about time to use the follow-cam I made back in Chippenham. I had a chat with the guard at the Benin Navy base next door, a little radar station and a compound on the beach, to make sure I wasn’t going to get in trouble or shot at, but they were again really nice and relaxed about things. 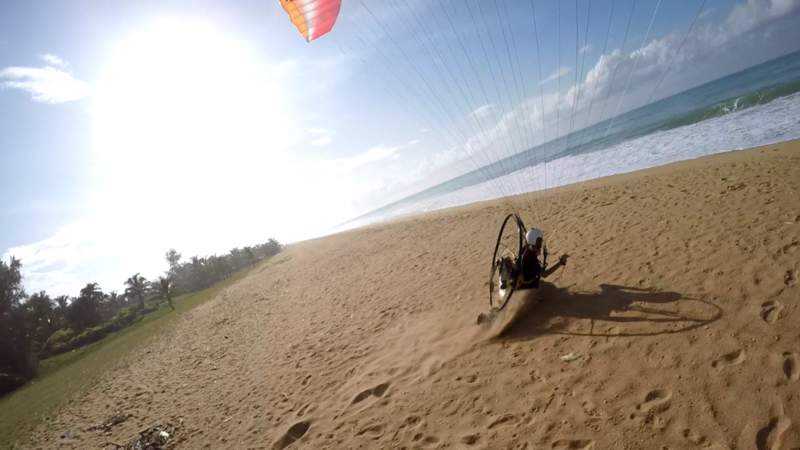 Take 1: Attempted take-off towards the sea after setting up in zero-wind. Just for a light zephyr from the right to pick up as I ran onto the soft sand. Aborted take-off and face-planted just short of the bit where the beach sloped steeply towards the wet stuff. 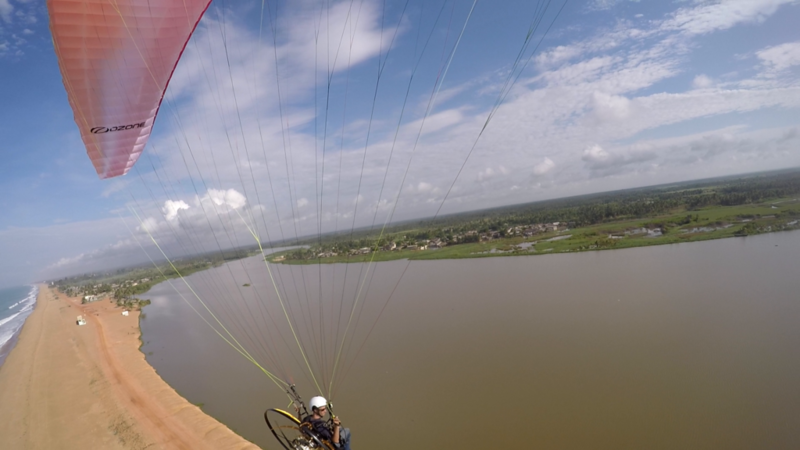 Take 2: Take off towards the Naval Base after re-setting wing and fending off enthusiastic local guy. Distraction made me miss that I’d got my left brake line looped through the other risers, locking on a fair amount of brake, which led to a permanent left turn tendency towards the sea. Gained some altitude whilst looping round for a landing and untangling the brakes…decided better to do that on the ground. Big mental note to do my checks properly. 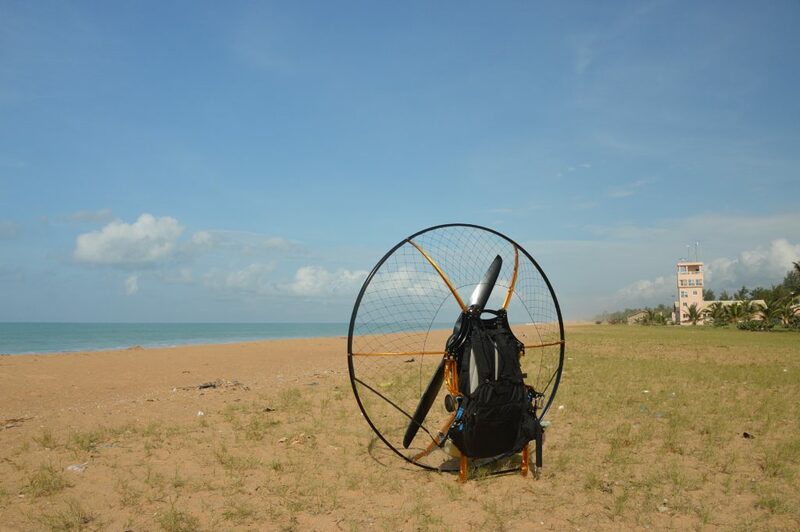 Take 3: Much better – took off cruised along the beach above the surf and took a look at the lagoon. Low flying along beaches has to be one of my favourite things. Very nice flight. 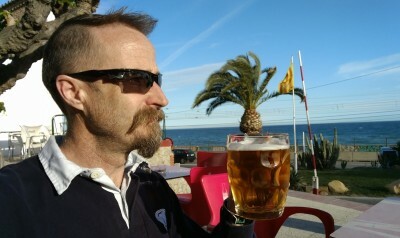 Back at the Auberge, the WiFi was not looking like working any time soon so I had to move on down the coast. 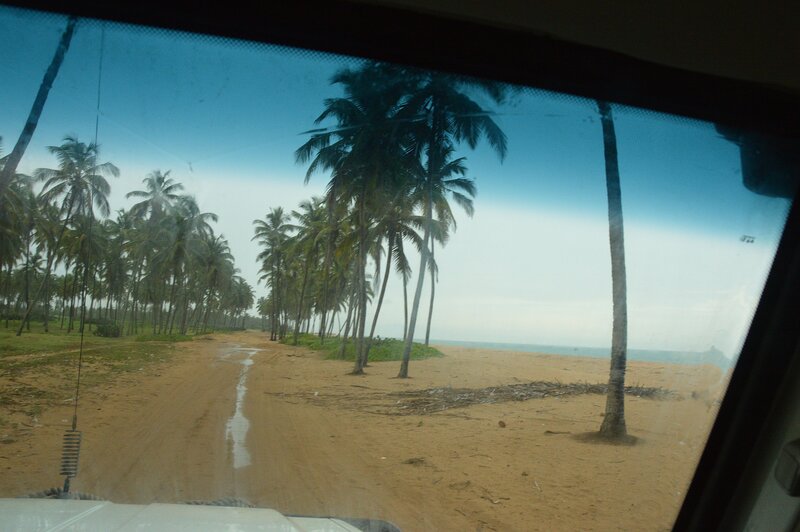 The next place on iOverlander that was supposed to have WiFi was a little way along near Ouidah. Entering Ouidah, the skies darkened and we went into a full rainy-season flush cycle just as I caught up with a slow moving police pickup. The short version of this episode is that I was pulled over for something or other he deemed excuse-worthy and told to give him 60,000CFA or he’d impound the car because I couldn’t find my International Drivers Permit. Obviously no receipt, and I didn’t have that much cash so he grumpily took all my remaining money [CFA, plus some US Dollars and £10], helpfully directed me to the cash machine and drove off. I needed cash so went to the bank, and then headed for the beach where I intended to camp. This involved driving through water up to 2ft deep, and when I got there I couldn’t find the place I was looking for. Then I spotted the nice police chap heading my way again, to where I’d foolishly told him I was going to stay. He didn’t see me and went back to the other side of the flood and parked up to wait. At this point I was feeling a little trapped with my newly filled wallet on what seemed to be an island with one 1 way out. Well, I thought I might as well drive along the beach and see how far towards Cotonou it would take me. Did I mention its the rainy season? Actually it was a really nice drive on a sandy beach track under coconut palms for 30km, and I arrived at Chez Rada in time for dinner. Its a beautiful place with a huge seawater pool, run by a lovely Bosnian/German lady for the past few decades. I was able to get connected to the internet (Benin actually has decent 3G), and discovered what Kevin and Heike were up to, which included having their suspension welded back together. I waited for them to get their Benin visa passing the time swimming in the pool, eating nice (though not very African) food and hanging out with the resident and visiting artists for a few more days. In the end it became clear they weren’t going to make it to Benin and I would have to run the gauntlet of the Ouidah police again and head back to Togo. So we switched the shipping from Cotonou to Lome. The trip to Lome was mostly uneventful, apart from a few small ‘extras’ paid on the border, and the heavy rain and wading through dirty water up to Troopy’s eyeballs. I met up with Kevin and Heike at Chez Alice (another overlander favourite), and spent our last few days in West Africa there before we loaded the cars into a container. Shipping has been the subject of many a horror story, but we had a really nice experience with the agent in Lome, and it all seems to be going smoothly and without surprises of the nasty or expensive kind! Thank you for following the adventures so far – after a brief intermission we will be back for more in Namibia!